While browsing patterns, I often notice that companies usually offer varied versions of the same basic patterns throughout their catalog. One way they do this is by updating the pattern for a new season. 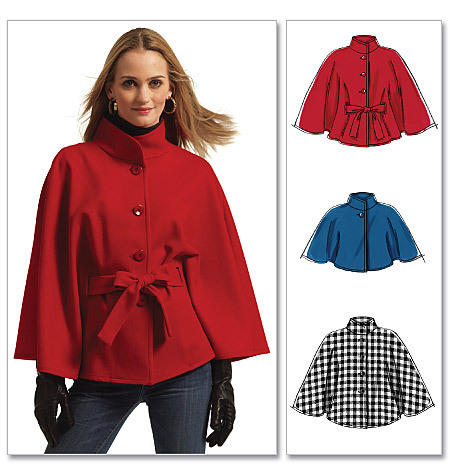 My Winter Cape, for example, was made from McCall's Easy Stitch n' Save Misses' Capelets and Belts #M5913 (left). 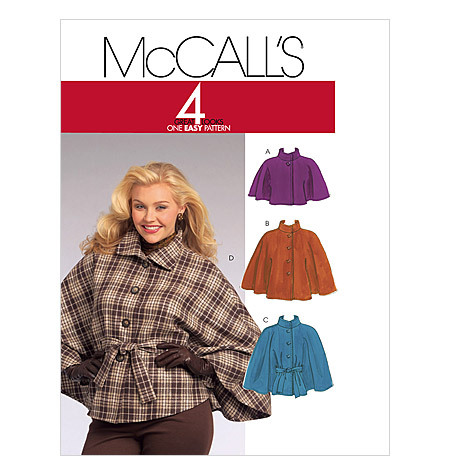 It is now sold under 4 Great Looks, One Easy Pattern Misses' Capelets and Belts #M5764 (right). As far as I can tell, all that was added was an alternative collar and some new fabrics, although I must have passed up the new one and bought the old one when I was first looking. Which brings me to an interesting point: we often buy patterns based on the styling on the cover and not the actual construction of the garment. However, if we learn to look at the line drawings (and it doesn't help that McCall's colors them in and Amy Butler doesn't provide them at all), then we will get a lot more out of our pattern purchases. This is also true with the second way that companies reuse patterns. I was surprised today to see that Simplicity repeats the same sillhoutte all in the same catalog. So before you go out and buy five dress patterns, check out the basic sillhoutte and see if you can't get the same dress out of one pattern or a pattern you already have. This is exactly what I found while browsing the Simplicity catalog. Check out how these nine dresses are all variations on the same bodice pattern. I am excited to use my new Simplicity #4070, which I will use as a basic strapless pattern. (I have previously struggled with a good strapless neckline in my Sweetheart Bubble Dress, Halloween Costume, Graduation Dress.) The pattern was originally recommended to me by Abiah88, who used Simplicity #2440. So choose your favorite and get started! Update: Another pattern I am thinking of trying is Miasu's Counter Bust Pattern from BurdaStyle. A bit of a different take, one extra seam, but totally free! Here's a good pic of how the seams come together. Thanks for posting this! I just started reading your blog here - came from burda style's website. But I'm trying to work a pattern for a dress with a halter top, ruched waist and fitted skirt and the pattern i drafted out myself wasn't quite the right shape in the bodice - lots of gaping. So I think I might have to buy that one that has a halter and modify it to make it do what I want. Anyway...thanks for posting this. I've definitely noticed that I lot of people say they have trouble with bodices--myself included! We'll both have to try this pattern and see how it works.